I threw myself on the ground, on top of the pebbles, my heart drained of blood, my hands icy. I was fourteen years old, and the man who had entered the tree to die was my father. As we move back to the small village where the novel is to unfold, we follow the next stages in the boy’s life, with particular attention paid to the gradual development of his relationship with his teenage step-mother. While that may not seem such a major drama, their growing closeness is to lead to the boy’s social ostracisation. This is a place where even the smallest deviation from social norms is frowned upon, and anyone who seeks to challenge the status quo is inviting trouble into their home. Death in Spring is a shortish, gripping novel, and like War, So Much War, a fairytale air hovers over the story. However, this is no Disneyfied story for kids but rather one of those original versions your parents never let you read when you were little. With the writer avoiding names, for both the characters and the village, or any identifying markers, the story could be set anywhere, and it all comes across as a timeless tale of the dangers of isolation (and a pretty disturbing one at that). I can’t say that this is my kind of food, but so far it’s still a typical literary portrait of a rural community of times gone by. The novel is in four parts, each divided into short chapters and telling one part of the boy’s life. As he becomes a man, he begins to question the beliefs of the village, coming up against the local blacksmith, the enforcer in chief of the old ways, in the process. Later in the novel, there is a slight cultural shift, and we meet other characters who exist outside the community, such as a prisoner caged like an animal and the blacksmith’s feeble son. The man attempts to go his own way, but standing out too much, he becomes a target for all the village’s loathing, unlikely to escape harm for long. The boy, growing up in this closed world, is fully aware that there’s no way out; the saddest thing is that even your death is taken out of your hands. While Rodoreda and Tennent have combined to create a beautiful text, the context is enough to make you shudder at times. 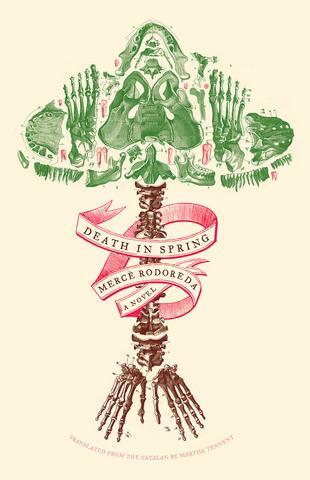 Nevertheless, Death in Spring is definitely a book I’d recommend, and Rodoreda is the kind of writer Women in Translation Month is all about. Sounds very dark and weird – no doubt good but I’m not sure I feel quite up to that right now…. !